Mol. Cells. May 31, 2018; 41(5): 486-494. Recently, we have reported that animals with telomerase reverse transcriptase (TERT) overexpression exhibit reduced social interaction, decreased preference for novel social interaction and poor nest-building behaviors symptoms that mirror those observed in human autism spectrum disorders (ASD). Overexpression of TERT also alters the excitatory/inhibitory (E/I) ratio in the medial prefrontal cortex. However, the effects of TERT overexpression on hippocampal-dependent learning and synaptic efficacy have not been investigated. In the present study, we employed electrophysiological approaches in combination with behavioral analysis to examine hippocampal function of TERT transgenic (TERT-tg) mice and FVB controls. We found that TERT overexpression results in enhanced hippocampal excitation with no changes in inhibition and significantly impairs long-term synaptic plasticity. 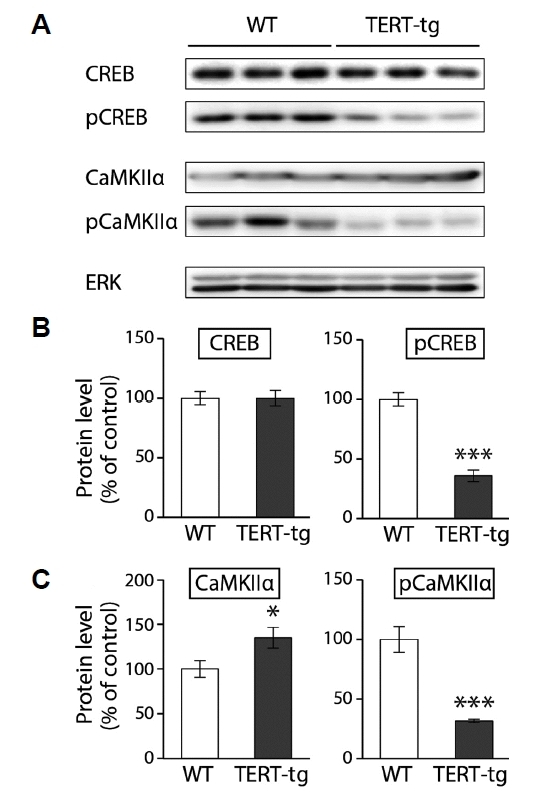 Interestingly, the expression levels of phosphorylated CREB and phosphory-lated CaMKIIα were significantly decreased while the expression level of CaMKIIα was slightly increased in the hippocampus of TERT-overexpressing mice. Our observations highlight the importance of TERT in normal synaptic function and behavior and provide additional information on a novel animal model of ASD associated with TERT overexpression. Autism spectrum disorders (ASD) are a class of neurodevel-opmental disorders diagnosed based on a triad of symptoms including deficits in language and communication; impaired or abnormal social interactions; and restricted range of interests or repetitive behaviors. Patients with ASD also experience difficulties with multisensory integration and exhibit impaired higher-order cognitive functions such as those related to learning and social skills (Rendall et al., 2016). It is well-known that genetic factors contribute to the etiology of ASD. Previous studies have identified several synaptic genes such as neurexin, neuroligin, postsynaptic density-95 (PSD-95), synapse-associated protein 90/postsynaptic density-95-associated protein (SAPAP) and Shank, as candidate genes that may afford susceptibility to ASD (Sudhof, 2008). These genetic animal models are commonly reported to show an imbalance between excitation and inhibition (E/I) in the brain, leading to propose E/I imbalance as a main endophenotype of ASD (Etherton et al., 2011; Gogolla et al., 2009; Rubenstein and Merzenich, 2003). Recently, we have shown that overexpression of telomerase reverse transcriptase (TERT) induces ASD-like behavioral symptoms as well as synaptic deficits in the medial prefrontal cortex (mPFC) (Kim et al., 2015). At the end of each chromosome, all vertebrates have repeating “TTAGGG” DNA sequences called telomeres (Moyzis et al., 1988). Repeated cell divisions cause telomeres to shorten (Harley et al., 1990) while telomerase activity in actively proliferating cells elongates these telomeric sequences. Telomerase consists of telomere reverse transcriptase (TERT), a catalytic enzyme of telomerase, and telomerase RNA (TERC), an RNA template (Autexier and Lue, 2006). As telomerase is required for elongation of shortened telomeres during repeated cell division, it remains highly active in neural progenitor cells (Cheng et al., 2007). TERT has been shown to regulate gene expression, potentially exerting such regulatory effects on both Pax6 expression (Eberhardt et al., 2006; Matsumoto et al., 2006) and Wnt-signaling (Choi et al., 2008; Park et al., 2009; Zhao et al., 2010), indicating that changes in TERT levels may underlie neurodevelopmental defects. In a previous study, we reported that TERT-overexpressing transgenic (TERT-tg) animals exhibit repetitive behaviors and deficits in social interaction; these symptoms are commonly observed in ASD patients as well as other animal models (Kim et al., 2015). We also observed enhanced excitation in the mPFC in TERT-tg animals, suggesting that TERT overexpression throughout the developmental process may cause E/I imbalances in the mPFC (Kim et al., 2015). However, mixed observations have been reported regarding the performance of patients with ASD on tests of spatial cognition (Caron et al., 2004; Edgin and Pennington, 2005; Lind et al., 2013; Prior and Hoffmann, 1990). Here, we aimed to investigate the synaptic and behavioral deficits associated with hippocampal activity in a newly suggested animal model of ASD with TERT overexpression. Animal treatment and maintenance were carried out in accordance with the Principles of Laboratory Animal Care (NIH publication No. 85-23, revised 1985) and were approved by the Animal Care and Use Committee of Konkuk University, Seoul, Korea (KU12016 and KU12115). FVB mice were obtained from DaeHan BioLink (Daejeon, Korea). Animals were housed in a controlled vivarium on a 12:12-h light/dark cycle (lights on at 06:00) at a constant temperature (22 ± 2°C) and humidity (55 ± 5%). Animals had free access to food and water. All efforts were made to minimize the number of animals sacrificed as well as their suffering. For electrophysiological recording, coronal slices containing the hippocampus (300 μm) were prepared using standard procedures (Kim et al., 2015). Briefly, 3–4 weeks old male mice were anesthetized with isoflurane prior to decapitation and their brains were rapidly extracted into ice-cold sucrose dissecting solution containing (in mM): 212 sucrose, 3 KCl, 26 NaHCO3, 1.25 NaH2PO4, 7 MgCl2, and 10 glucose. Brain slices were made using a Leica VT1200S vibrating tissue slicer and placed in a submerged holding chamber with artificial cerebrospinal fluid (aCSF) containing (in mM): 118 NaCl, 2.5 KCl, 1 NaH2PO4, 26.2 NaHCO3, 11 glucose, 2 CaCl2, and 1 MgCl2 (oxygenated with 95% O2/5% CO2) and kept at 35°C for one hour then stored at room temperature. For whole-cell voltage clamp recordings pyramidal neurons were voltage clamped to −60 mV or 0 mV to measure excitatory or inhibitory transmission respectively using an Axo-clamp-200B (Axon Instruments, Union City, USA) filtered at 2 kHz and sampled at 50 kHz, and pClamp software (Version 10.3, Axon Instruments) was used for data acquisition and analysis. The patch pipettes (2–6 MΩ) were filled with solution containing (in mM): 115 Cs methanesulphonate, 20 CsCl, 10 HEPES, 2.5 MgCl2, 4 Na2-ATP, 0.4 Na2-GTP, 10 Na-phosphocreatin, and 0.2 EGTA (pH 7.2). To isolate inhibitory or excitatory synaptic transmission, either CNQX (10 μM) with AP5 (50 μM) or picrotoxin (50 μM) was added throughout the experiments, respectively. 1 μM of tetrodotoxin (TTX) was added to measure miniature excitatory postsynaptic currents (mEPSCs) and miniature inhibitory postsynaptic currents (mIPSCs). Input and series resistance were monitored continuously throughout the experiments. Extracellular field excitatory postsynaptic potentials (fEP-SPs) were recorded in CA1 dendrites with two bipolar stimulating electrodes being placed in the stratum radiatum using glass pipettes (0.5–1.5 MΩ) filled with aCSF. The fEPSPs were alternately evoked via stimulating electrodes at 30 sec intervals (Kim et al., 2016). Theta burst stimulation (TBS, 20 bursts of 4 pulses at 100 Hz) or high frequency stimulation (HFS, 100 pulses at 100 Hz) was delivered at one pathway to induce LTP while the other pathway remained off during the stimulation. For the Morris water maze task, a circular tank (diameter 183 cm, height 0.58 cm) was filled with tap water (26 ± 1°C) with nontoxic white paint. The fixed escape platform (diameter 20 cm) was located 1 ± 0.5 cm below the surface of the water and centered in one of the four maze quadrants. The maze was surrounded by white curtains, on which black felt patterns were affixed to provide distal visual (spatial) cues. Data were recorded using an HVS Image tracking system (Hampton, UK). 12–13 weeks of male mice received 4 trials/day (10 min inter-trial interval, maximum trial duration of 60 s, with 20 s spent on the platform at the end of each trial). Each trial began at one of four equidistantly located positions at the perimeter of the maze. The location of the hidden platform remained constant across all training trials. Mice were placed into the water facing the wall. The trial ended when a mouse climbed onto the hidden platform or after the 60-s interval had elapsed. If a mouse did not locate the platform during a trial, it was guided to the platform by the experimenter. Mice were left on the platform for 20 s, and then moved to a holding cage for a 10-min inter-trial interval. During each trial, the distance of the mouse from the hidden platform was sampled 10 times per second, and the results were averaged in 1-sec bins. Cumulative search error was calculated as the summed 1-sec averages of this proximity measure, corrected for the particular start location of each trial. Probe tests were conducted 1 trial/day on day 5 before training and on day 9 without any following training session. During probe tests, the hidden platform was removed and mice were put into the water facing the wall and left swimming for 60 s. After 60 s, the platform was placed again and mice were guided to the platform where they stayed for another 20 s.
Brain tissues obtained from 28 days old male mice were homogenized using RIPA buffer (150 mM NaCl, 1% Triton X-100, 0.5% sodium deoxycholate, 0.1% SDS, 50 mM Tris, pH 8.0), and the resulting lysates were diluted with 2× SDS-PAGE sample buffer. Equal amounts of protein (50 μg) determined by BCA protein assay was separated by 10% SDS-PAGE and transferred to nitrocellulose membranes. The membranes were blocked with 1% polyvinylalcohol in PBS containing 0.2% Tween-20 for 1 h. The membranes were incubated with primary antibody overnight at 4°C followed by incubation with peroxidase-conjugated secondary antibody (sc-2030, USA) for 2 h at room temperature. αCaMKII and phosphorylated-αCaMKII (T286) antibodies were obtained from Abcam (#ab92332, #ab5683, Cambridgeshire, England). ERK1/2, CREB and phosphorylated CREB antibodies were purchased from Cell Signaling (#9102, #9197, #9198, USA). Specific bands were detected using the ECL system (Amersham, UK) and exposed using the Bio-Rad electrophoresis image analyzer (Bio-Rad, UK). Data are shown as mean ± S.E.M. Student’s t-test was used to evaluate differences between TERT-tg and control mice in electrophysiological experiments. Escape latencies and search error during the Morris water maze task were separately analyzed using a repeated measures two-way analysis of variance (ANOVA; group × trial session [day]) and a repeated measures one-way ANOVA with Bonferroni correction. To investigate the effect of overexpression of TERT on synaptic efficacy, we measured miniature excitatory postsynaptic currents (mEPSCs) of hippocampal CA1 neurons in a whole-cell patch clamp configuration. Whole-cell voltage clamp recordings from coronal brain slices containing the hippocampus were performed as described previously (Kim et al., 2015). No significant difference was observed in the mean frequency of mEPSCs or inter-event-intervals between TERT-overexpressing transgenic (TERT-tg) mice and control FVB mice (Fig. 1A, n = 10, p > 0.6 by t-test, p > 0.6 by Kolmogorov–Smirnov test), while the mean amplitude of mEPSCs in TERT-tg mice was significantly increased compared to control mice (Fig. 1A, p < 0.01 by t-test, p < 0.05 by Kolmogorov–Smirnov test). 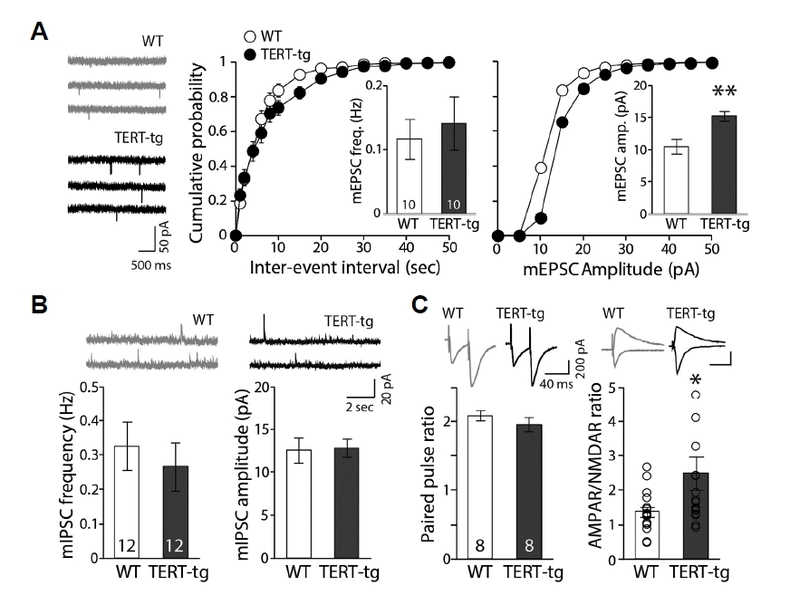 Both the frequency and amplitude of miniature inhibitory postsynaptic currents (mIPSCs) in TERT-tg mice remained comparable to those of control FVB mice (Fig. 1B, n = 12, p > 0.7). Our observations demonstrate that overexpression of TERT leads to a selective increase in spontaneous excitatory synaptic activity of CA1 neurons. This finding is consistent with our previous observations in the mPFC of TERT-tg mice (Kim et al., 2015). Next, we measured evoked excitatory postsynaptic currents (eEPSCs) by stimulating the Schaffer collateral pathway. The paired-pulse ratio was determined by comparing the peak amplitude of eEPSCs between two consecutive stimulations in 50 ms apart. AMPAR/NMDAR ratios were determined by comparing the peak amplitude of eEPSCs at holding potential of −60 mV and the average amplitude of the eEPSCs 50–60 ms after the stimulation at holding potential of +40 mV. No alterations in the paired pulse ratio were observed in TERT-tg mice (Fig. 1C, n = 8, p > 0.2), while the ratio of AMPA receptor-mediated eEPSCs to NMDA receptor-mediated eEPSCs was significantly increased in TERT-tg mice compared to that of control FVB mice (Fig. 1C, n = 9–10, p < 0.05). Our observations suggest that TERT-tg mice exhibit enhanced excitatory activity in the hippocampus and that this alteration is likely due to postsynaptic changes. To compare the capacity for synaptic plasticity, we measured field excitatory postsynaptic potentials (fEPSPs) and induced long-term potentiation (LTP) in TERT-tg mice and FVB mice in hippocampal CA1 neurons. High-frequency stimulation (HFS, 100 pulses at 100 Hz) induced robust potentiation in the hippocampus of control FVB mice as measured by both amplitude and 10–90% rise slope during 30–40 min after the LTP induction compared to the baseline (Figs. 2A, 2B, 2E and 2F, n = 15, p < 0.01 for amplitude; p < 0.01 for rise slope). However, HFS did not induce any significant changes in the amplitude or rise slope of fEPSPs in the hippocampus obtained from TERT-tg mice (Figs. 2C–2F, n = 13, p > 0.5 for amplitude; p > 0.6 for rise slope). We employed another well-established pattern of stimulation to induce LTP, theta-burst stimulation (TBS, 20 bursts of 4 pulses at 100 Hz). TBS potentiated fEPSPs in the FVB mice (Figs. 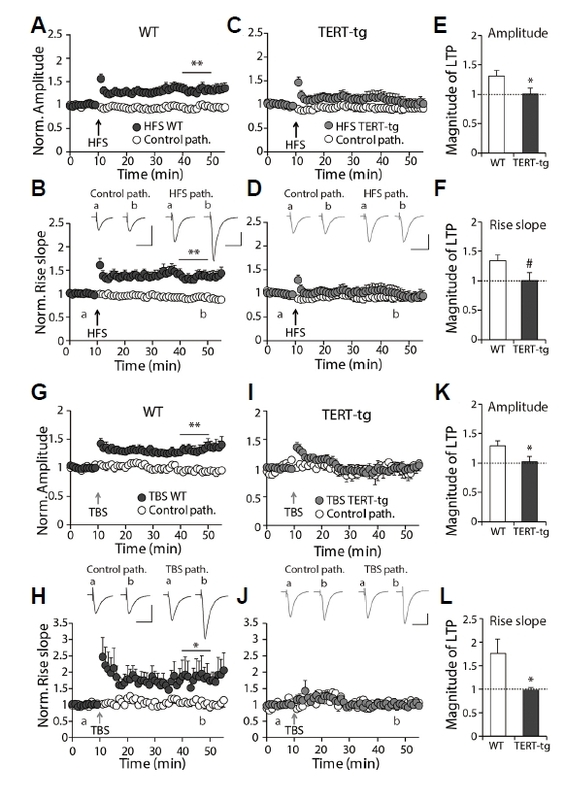 2G, 2H, 2K and 2L, n = 8, p < 0.01 for amplitude; p < 0.05 for rise slope), whereas TBS-induced long-term potentiation was impaired in the hippocampi of TERT-tg mice (Figs. 2I–2L, n = 7, p > 0.6 for amplitude; p > 0.9 for rise slope). Taken together, our observations suggest that overexpression of TERT causes an imbalance between excitatory/inhibitory neurotransmission and alters the capacity for synaptic plasticity in the hippocampus. Do TERT overexpression-induced synaptic changes alter cognitive behaviors? In order to pursue this question, we tested the performance of TERT-tg mice during hippocampal-dependent spatial learning using the Morris water maze. Mice were trained to search for a hidden platform with contextual environmental cues during 4 trials per day for 8 days. The performance level at each day was evaluated using two parameters: latency to target platform and search error which indicates total distance between the mouse and the target platform throughout trials. Repeated measures two-way ANOVA in both latency and search error indicated that the performance improved over the course of training (Fig. 3, latency: F(7,126) = 3.33, p < 0.005, search error: F(7,126) = 2.72, p < 0.05, main effect for day). However, there was a significant main effect for group (latency: F(1,17) = 41.92, p < 0.001, search error: F(1,17) = 19.27, p < 0.001) and a significant group × day interaction (latency: F(7,126) = 3.78, p < 0.005, search error: F(7, 126) = 3.83, p < 0.001), indicating different rates of learning for control FVB mice and TERT-overexpressed mice. Repeated measures one-way ANOVA with post-hoc Bonferroni correction indicated that repetitive training improved performance of FVB control mice by reducing the latency (Fig. 3B, n = 9, F(7) = 5.97, p < 0.001), and search error (Fig. 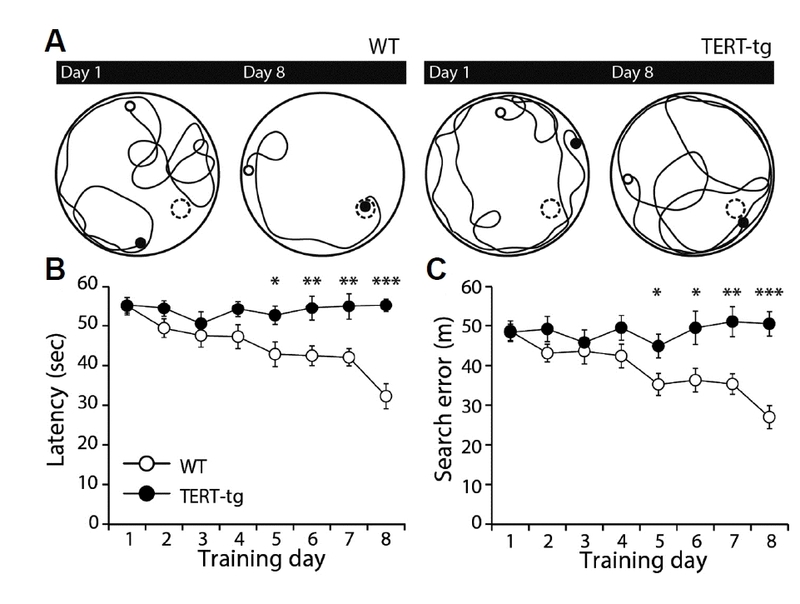 3C, n = 9, F (7) = 6.05, p < 0.001).Repetitive training did not improve performance in TERT-tg mice (Figs. 3B and 3C, F(7) = 0.45, p > 0.8 for latency; F(7) = 0.6, p > 0.7 for search error; F(7) = 1.22, p > 0.3). However, in the probe test that was conducted to determine the rate of spatial memory consolidation on day 5 and 9, we did not find any performance differences between FVB control and TERT-tg mice for the time spent in the target quadrant (23.43 ± 2.06 sec for WT; 22.12 ± 5.24 s for TERT-tg, p > 0.8) and the total distance swum in the target quadrant (23.32 ± 2.09 m for WT; 22.92 ± 5.19 m for TERT-tg, p > 0.9). Given our results, even though memory consolidation is limited possibly due to the strain used, spatial learning rate in an animal model of ASD with TERT overexpression is significantly disrupted compared to that of control mice. In order to investigate whether there are chronic changes in expression of learning-related molecules upon TERT overexpression, we performed Western blot analysis for a well-known transcription factor, CREB (cAMP response element-binding protein) and a serine/threonine-specific protein kinase known to be important for learning and memory, CaMKIIα (Ca2+/calmodulin-dependent protein kinase IIα). We found that TERT overexpression was significantly decreased phosphorylated CREB expression (Figs. 4A and 4B, n = 6, p < 0.001), while the total CREB levels remained comparable to those of the FVB control group (p > 0.9). In addition, we observed a dramatic decrease in phosphorylated CaMKIIα expression (Figs. 4A and 4C, n = 6, p < 0.001) in contrast to increased CaMKIIα expression in the hippocampus of TERT-tg mice (p < 0.05). Given the importance of phosphorylated CaMKIIα and phosphorylated CREB in learning and memory (Appleby et al., 2011; Bourtchuladze et al., 1994; Qiao et al., 2014; Sweatt, 1999; Wang et al., 2008; Yu and Ren, 2013), these results corroborate the impaired synaptic plasticity and poor performance in spatial learning in TERT-tg mice. In the present study, we found that TERT overexpression distorts the balance between excitation and inhibition, impairs hippocampal synaptic plasticity, and reduces the expression of learning-related molecules (phosphorylated CREB and phosphorylated CaMKIIα) in the hippocampus. Given that ASD is a neurodevelopmental disorder, symptoms could differ depending on the stages of development as well as differential E/I imbalances in different brain areas. In our previous study, we reported enhanced synaptic transmission in the mPFC of TERT-tg mice (Kim et al., 2015), similar to that observed in the hippocampus in the present study. However, cortical neurons with Shank3 knockdown show reduced NMDAR-mediated eEPSCs (Duffney et al., 2015) while synaptic efficacy in the hippocampus of Shank3 deficient mice remains largely comparable to that of control mice (Peca et al., 2011). Rats exposed to valproic acid (VPA) show increased synaptophysin immunostaining in the mPFC but reduced synaptophysin signals in the hippocampus (Codagnone et al., 2015). Thus, different animal models of ASD exhibit dissociated E/I imbalances with distinct mechanisms in different brain regions, likely leading to inconsistent observations of spatial cognitive functions. Further investigation of how chronic TERT overexpression may contribute to enhanced excitation in different brain areas is required for additional validation of this novel animal model of ASD. Interestingly, TERT overexpression resulted in striking differences in expression of certain proteins including phosphorylated CaMKIIα (pCaMKIIα) in the hippocampus and mPFC (Fig. 4) (Kim et al., 2015). In the mPFC, we previously showed that overexpression of TERT induced increased expression of both CaMKIIα and pCaMKIIα (Kim et al., 2015). However, in the hippocampus, the expression of pCaMKIIα was greatly decreased with TERT overexpression while CaMKIIα expression was slightly elevated compared to that of control FVB mice (Fig. 4). Along with decreased pCaMKIIα, the expression of phosphorylated CREB (pCREB) was significantly reduced in TERT-tg animals. It is well- documented that CaMKII activation and phosphorylation of the CREB by CaMKII signaling cascades are critical for induction and maintenance of synaptic plasticity (Appleby et al., 2011; Bourtchuladze et al., 1994; Qiao et al., 2014; Sweatt, 1999; Wang et al., 2008; Yu and Ren, 2013), although there is a recent study suggesting that CaMKIIα auto-phosphorylation may not be necessarily required for the induction of LTP in the hippocampus (Villers et al., 2014). 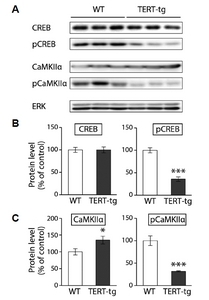 Other factors to reduce the phosphorylation of CaMKII and CREB include apolipoprotein E4 and zinc deficiency, which have been shown to impair hippocampal long-term synaptic plasticity and cognitive performances (Qiao et al., 2014; Yu and Ren, 2013). Therefore, significant reduction in both pCREB and pCaMKIIα observed in the hippocampus of TERT-tg mice may have contributed to the impaired LTP and poor spatial learning in these mice model of ASD. Future investigations on TERT-mediated direct or indirect regulation of learning and memory-related molecules are required to provide molecular evidences of region-specific transcriptional or translational alterations during development. It seems the elevated basal excitatory transmission by overexpression of TERT occludes synaptic potentiation. This may be counter-intuitive, but several studies have reported that tonic enhancement of basal excitatory transmission leads to impairment of LTP, which may provide mechanical insights for our seemingly contradictory observations. For example, incubation with extracellular solution containing reduced Mg2+ enhanced basal excitatory transmission shown by increased fEPSP slope with significantly impaired LTP in the hippocampus (Frankiewicz and Parsons, 1999). The 2,4,6-trinitrobenzenesulfonic acid (TNBS)-treated animal model of chronic inflammation also exhibits increased amplitudes of mEPSCs and AMPAR- and NMDAR-mediated eEP-SCs in CA1 pyramidal neurons. Again, in spite of elevated excitatory synaptic transmission, both LTP and long-term depression (LTD) in the Schaffer collateral pathway of TNBS-injected animals were significantly reduced (Riazi et al., 2015). In case of overexpression of PSD-95, it has been shown to increase both amplitude and frequency of mEPSCs and AMPAR-mediated synaptic responses while also blocking the induction of LTP (Stein et al., 2003). In this case, however, LTD was enhanced upon PSD-95 overexpression. Therefore, it would be of interest for future studies to examine whether TERT overexpression enhances or blocks the induction of LTD in the hippocampus. Our observations are consistent with hippocampal dysfunction reported in other animal models of ASD including valproic acid-exposed animals and several knockout animal models. For example, prenatal exposure of rats to VPA results in a pharmacological model of ASD in which the animals exhibit increased latency in finding the hidden platform in the Morris water maze test (Gao et al., 2016). Prenatal exposure to VPA also impairs both LTP and LTD in the Schaffer collateral pathway of the hippocampus (Puscian et al., 2014; Zhang et al., 2003). The Shank2 knockout mouse is a well-established animal model of ASD that exhibits impaired NMDAR-dependent LTP and LTD in the hippocampus. In addition, spatial learning as evaluated by the Morris water maze test was also impaired in Shank2 knockout mice (Won et al., 2012). However, in another shank protein-related animal model of ASD, no changes in field recordings of population spikes or paired-pulse ratio were observed in the hippocampus of Shank3 knockout mice (Peca et al., 2011). Neurexin-1α deficient mice show decreased mEPSC frequency and reduced evoked excitatory synaptic transmission in the CA1 region of the hippocampus. However, no changes in performance on the Morris water maze test were observed in mice with Neurexin-1α deficiency (Etherton et al., 2009). In TERT-tg mice, we observed significantly slower acquisition of spatial task yet failed to observe any impairment in probe test trials conducted between training sessions. There are two possible explanations for our observations. First, TERT overexpression may impair hippocampus-dependent learning per se but not consolidation. Previously, BrdU signals representing adult hippocampal neurogenesis were shown to selectively correlate with acquisition in the water maze task while no significant correlation was observed in the target quadrant preference during probe trial performance (Kempermann and Gage, 2002). TERT overexpression may have differential effects on different aspects of spatial learning and memory. Second, our results could be due to the limitations of the strain of choice. Unfortunately, currently available TERT-tg mice is generated in FVB/N background and FVB/N mice are known to have poor performance in probe trials of visual cue-dependent Morris water maze test due to their poor vision (Brown and Wong, 2007; Owen et al., 1997). FVB/N mice exhibit longer latency to reach the platform compared to other strains of mice. Nevertheless, gradual improvement in their performance throughout training trials has been reported repeatedly in FVB/N mice including our current data (Beeri et al., 1997; Errijgers et al., 2007; Hsiao et al., 1996; Pollak et al., 2005; Voikar et al., 2001) (Fig. 3). In fact, FVB mice have vision impairment but not completely (Errijgers et al., 2007). The poor vision might not be enough for a memory consolidation to guarantee their performance in probe trials, while allowing acquisition of spatial learning at some levels. FVB/N mice have been commonly used to generate transgenic mice and it would be a lot of work to backcrossing animals to change backgrounds. FVB/N mice are known to be perfectly capable of performing trace eyeblink conditioning, spontaneous alternation in the Y-maze, social recognition, trace and contextual fear conditioning, and odor habituation-dishabituation (Farley et al., 2011), suggesting that the cognitive ability of FVB/N per se is not a question. Further studies are required to employ elaborated sets of cognitive tests to evaluate hippocampus function of TERT-tg mice. The results of the present study, taken with those of previous reports, indicate that TERT-tg mice exhibit elevated excitatory transmission while inhibitory transmission remains unchanged in both the mPFC and hippocampus. This imbalance in the excitatory/inhibitory ratio may lead to hippocampal dysfunction as well as other ASD-like behaviors in TERT-tg mice. One interesting question that remains to be examined is whether TERT expression levels are altered in different animal models of ASD, which may provide further support for TERT levels as a tentative biomarker for ASD. Mol. Cells.May 31, 2018; 41(5): 486-494. Received March 27, 2018; Accepted April 2, 2018. Appleby, V.J., Correa, S.A., Duckworth, J.K., Nash, J.E., Noel, J., Fitzjohn, S.M., Collingridge, G.L., and Molnar, E. (2011). LTP in hippocampal neurons is associated with a CaMKII-mediated increase in GluA1 surface expression. J Neurochem. 116, 530-543. Autexier, C., and Lue, N.F. (2006). The structure and function of telomerase reverse transcriptase. Annu Rev Biochem. 75, 493-517. Beeri, R., Le Novere, N., Mervis, R., Huberman, T., Grauer, E., Changeux, J.P., and Soreq, H. (1997). Enhanced hemicholinium binding and attenuated dendrite branching in cognitively impaired acetylcholinesterase-transgenic mice. J Neurochem. 69, 2441-2451. Bourtchuladze, R., Frenguelli, B., Blendy, J., Cioffi, D., Schutz, G., and Silva, A.J. (1994). Deficient long-term memory in mice with a targeted mutation of the cAMP-responsive element-binding protein. Cell. 79, 59-68. Brielmaier, J., Matteson, P.G., Silverman, J.L., Senerth, J.M., Kelly, S., Genestine, M., Millonig, J.H., DiCicco-Bloom, E., and Crawley, J.N. (2012). Autism-relevant social abnormalities and cognitive deficits in engrailed-2 knockout mice. PloS One. 7, e40914. Brown, R.E., and Wong, A.A. (2007). The influence of visual ability on learning and memory performance in 13 strains of mice. Learn Mem. 14, 134-144. Caron, M.J., Mottron, L., Rainville, C., and Chouinard, S. (2004). Do high functioning persons with autism present superior spatial abilities?. Neuropsychologia. 42, 467-481. Cheng, A., Shin-ya, K., Wan, R., Tang, S.C., Miura, T., Tang, H., Khatri, R., Gleichman, M., Ouyang, X., and Liu, D. (2007). Telomere protection mechanisms change during neurogenesis and neuronal maturation: newly generated neurons are hypersensitive to telomere and DNA damage. J Neurosci. 27, 3722-3733. Choi, J., Southworth, L.K., Sarin, K.Y., Venteicher, A.S., Ma, W., Chang, W., Cheung, P., Jun, S., Artandi, M.K., and Shah, N. (2008). TERT promotes epithelial proliferation through transcriptional control of a Myc- and Wnt-related developmental program. PLoS Genet. 4, e10. Codagnone, M.G., Podesta, M.F., Uccelli, N.A., and Reines, A. (2015). Differential local connectivity and neuroinflammation profiles in the medial prefrontal cortex and hippocampus in the valproic acid rat model of autism. Dev Neurosci. 37, 215-231. Duffney, L.J., Zhong, P., Wei, J., Matas, E., Cheng, J., Qin, L., Ma, K., Dietz, D.M., Kajiwara, Y., and Buxbaum, J.D. (2015). Autism-like deficits in Shank3-deficient mice are rescued by targeting actin regulators. Cell Rep. 11, 1400-1413. Eberhardt, M., Salmon, P., von Mach, M.A., Hengstler, J.G., Brulport, M., Linscheid, P., Seboek, D., Oberholzer, J., Barbero, A., and Martin, I. (2006). Multipotential nestin and Isl-1 positive mesenchymal stem cells isolated from human pancreatic islets. Biochem Biophys Res Commun. 345, 1167-1176. Edgin, J.O., and Pennington, B.F. (2005). Spatial cognition in autism spectrum disorders: Superior, impaired, or just intact?. J Autism Dev Disord. 35, 729-745. Errijgers, V., Van Dam, D., Gantois, I., Van Ginneken, C.J., Grossman, A.W., D’Hooge, R., De Deyn, P.P., and Kooy, R.F. (2007). FVB.129P2-Pde6b(+) Tyr(c-ch)/Ant, a sighted variant of the FVB/N mouse strain suitable for behavioral analysis. Genes Brain Behav. 6, 552-557. Etherton, M., Foldy, C., Sharma, M., Tabuchi, K., Liu, X., Shamloo, M., Malenka, R.C., and Sudhof, T.C. (2011). Autism-linked neuroligin-3 R451C mutation differentially alters hippocampal and cortical synaptic function. Proc Natl Acad Sci USA. 108, 13764-13769. Etherton, M.R., Blaiss, C.A., Powell, C.M., and Sudhof, T.C. (2009). Mouse neurexin-1alpha deletion causes correlated electrophysiological and behavioral changes consistent with cognitive impairments. Proc Natl Acad Sci USA. 106, 17998-18003. Farley, S.J., McKay, B.M., Disterhoft, J.F., and Weiss, C. (2011). Reevaluating hippocampus-dependent learning in FVB/N mice. Behav Neurosci. 125, 871-878. Frankiewicz, T., and Parsons, C.G. (1999). Memantine restores long term potentiation impaired by tonic N-methyl-D-aspartate (NMDA) receptor activation following reduction of Mg2+ in hippocampal slices. Neuropharmacology. 38, 1253-1259. Gao, J., Wang, X., Sun, H., Cao, Y., Liang, S., Wang, H., Wang, Y., Yang, F., Zhang, F., and Wu, L. (2016). Neuroprotective effects of docosahexaenoic acid on hippocampal cell death and learning and memory impairments in a valproic acid-induced rat autism model. Int J Dev Neurosci. 49, 67-78. Gogolla, N., Leblanc, J.J., Quast, K.B., Sudhof, T.C., Fagiolini, M., and Hensch, T.K. (2009). Common circuit defect of excitatory-inhibitory balance in mouse models of autism. J Neurodev Disord. 1, 172-181. Harley, C.B., Futcher, A.B., and Greider, C.W. (1990). Telomeres shorten during ageing of human fibroblasts. Nature. 345, 458-460. Hsiao, K., Chapman, P., Nilsen, S., Eckman, C., Harigaya, Y., Younkin, S., Yang, F., and Cole, G. (1996). Correlative memory deficits, Abeta elevation, and amyloid plaques in transgenic mice. Science. 274, 99-102. Kempermann, G., and Gage, F.H. (2002). Genetic determinants of adult hippocampal neurogenesis correlate with acquisition, but not probe trial performance, in the water maze task. Eur J Neurosci. 16, 129-136. Kim, K.C., Rhee, J., Park, J.E., Lee, D.K., Choi, C.S., Kim, J.W., Lee, H.W., Song, M.R., Yoo, H.J., and Chung, C. (2015). Overexpression of telomerase reverse transcriptase induces autism-like excitatory phenotypes in mice. Mol Neurobiol. 53, 7312-7328. Kim, S., Kim, M.S., Park, K., Kim, H.J., Jung, S.W., Nah, S.Y., Han, J.S., and Chung, C. (2016). Hippocampus-dependent cognitive enhancement induced by systemic gintonin administration. J Ginseng Res. 40, 55-61. Kouser, M., Speed, H.E., Dewey, C.M., Reimers, J.M., Widman, A.J., Gupta, N., Liu, S., Jaramillo, T.C., Bangash, M., and Xiao, B. (2013). Loss of predominant Shank3 isoforms results in hippocampus-dependent impairments in behavior and synaptic transmission. J Neurosci. 33, 18448-18468. Lee, J., Chung, C., Ha, S., Lee, D., Kim, D.Y., Kim, H., and Kim, E. (2015). Shank3-mutant mice lacking exon 9 show altered excitation/inhibition balance, enhanced rearing, and spatial memory deficit. Front Cell Neurosci. 9, 94. Lind, S.E., Williams, D.M., Raber, J., Peel, A., and Bowler, D.M. (2013). Spatial navigation impairments among intellectually high-functioning adults with autism spectrum disorder: exploring relations with theory of mind, episodic memory, and episodic future thinking. J Abnorm Psychol. 122, 1189-1199. Matsumoto, S., Banine, F., Struve, J., Xing, R., Adams, C., Liu, Y., Metzger, D., Chambon, P., Rao, M.S., and Sherman, L.S. (2006). Brg1 is required for murine neural stem cell maintenance and gliogenesis. Dev Biol. 289, 372-383. Moyzis, R.K., Buckingham, J.M., Cram, L.S., Dani, M., Deaven, L.L., Jones, M.D., Meyne, J., Ratliff, R.L., and Wu, J.R. (1988). A highly conserved repetitive DNA sequence, (TTAGGG)n, present at the telomeres of human chromosomes. Proc Natl Acad Sci USA. 85, 6622-6626. Owen, E.H., Logue, S.F., Rasmussen, D.L., and Wehner, J.M. (1997). Assessment of learning by the Morris water task and fear conditioning in inbred mouse strains and F1 hybrids: implications of genetic background for single gene mutations and quantitative trait loci analyses. Neuroscience. 80, 1087-1099. Park, J.I., Venteicher, A.S., Hong, J.Y., Choi, J., Jun, S., Shkreli, M., Chang, W., Meng, Z., Cheung, P., and Ji, H. (2009). Telomerase modulates Wnt signalling by association with target gene chromatin. Nature. 460, 66-72. Peca, J., Feliciano, C., Ting, J.T., Wang, W., Wells, M.F., Venkatraman, T.N., Lascola, C.D., Fu, Z., and Feng, G. (2011). Shank3 mutant mice display autistic-like behaviours and striatal dysfunction. Nature. 472, 437-442. Penagarikano, O., Abrahams, B.S., Herman, E.I., Winden, K.D., Gdalyahu, A., Dong, H., Sonnenblick, L.I., Gruver, R., Almajano, J., and Bragin, A. (2011). Absence of CNTNAP2 leads to epilepsy, neuronal migration abnormalities, and core autism-related deficits. Cell. 147, 235-246. Pollak, D.D., Herkner, K., Hoeger, H., and Lubec, G. (2005). Behavioral testing upregulates pCaMKII, BDNF, PSD-95 and egr-1 in hippocampus of FVB/N mice. Behav Brain Res. 163, 128-135. Prior, M., and Hoffmann, W. (1990). Brief report: neuropsychological testing of autistic children through an exploration with frontal lobe tests. J Autism Dev Disord. 20, 581-590. Puscian, A., Leski, S., Gorkiewicz, T., Meyza, K., Lipp, H.P., and Knapska, E. (2014). A novel automated behavioral test battery assessing cognitive rigidity in two genetic mouse models of autism. Front Behav Neurosci. 8, 140. Qiao, F., Gao, X.P., Yuan, L., Cai, H.Y., and Qi, J.S. (2014). Apolipoprotein E4 impairs in vivo hippocampal long-term synaptic plasticity by reducing the phosphorylation of CaMKIIalpha and CREB. J Alzheimers Dis. 41, 1165-1176. Rendall, A.R., Truong, D.T., and Fitch, R.H. (2016). Learning delays in a mouse model of Autism Spectrum Disorder. Behav Brain Res. 303, 201-207. Riazi, K., Galic, M.A., Kentner, A.C., Reid, A.Y., Sharkey, K.A., and Pittman, Q.J. (2015). Microglia-dependent alteration of glutamatergic synaptic transmission and plasticity in the hippocampus during peripheral inflammation. J Neurosci. 35, 4942-4952. Rubenstein, J.L., and Merzenich, M.M. (2003). Model of autism: increased ratio of excitation/inhibition in key neural systems. Genes Brain Behav. 2, 255-267. Stein, V., House, D.R., Bredt, D.S., and Nicoll, R.A. (2003). Postsynaptic density-95 mimics and occludes hippocampal long-term potentiation and enhances long-term depression. J Neurosci. 23, 5503-5506. Sudhof, T.C. (2008). Neuroligins and neurexins link synaptic function to cognitive disease. Nature. 455, 903-911. Sweatt, J.D. (1999). Toward a molecular explanation for long-term potentiation. Learn Mem. 6, 399-416. Villers, A., Giese, K.P., and Ris, L. (2014). Long-term potentiation can be induced in the CA1 region of hippocampus in the absence of alphaCaMKII T286-autophosphorylation. Learn Mem. 21, 616-626. Voikar, V., Koks, S., Vasar, E., and Rauvala, H. (2001). Strain and gender differences in the behavior of mouse lines commonly used in transgenic studies. Physiol Behav. 72, 271-281. Wang, H., Feng, R., Phillip Wang, L., Li, F., Cao, X., and Tsien, J.Z. (2008). CaMKII activation state underlies synaptic labile phase of LTP and short-term memory formation. Curr Biol. 18, 1546-1554. Won, H., Lee, H.R., Gee, H.Y., Mah, W., Kim, J.I., Lee, J., Ha, S., Chung, C., Jung, E.S., and Cho, Y.S. (2012). Autistic-like social behaviour in Shank2-mutant mice improved by restoring NMDA receptor function. Nature. 486, 261-265. Yu, X., and Ren, T. (2013). Disruption of calmodulin-dependent protein kinase II alpha/brain-derived neurotrophic factor (alpha-CaMKII/BDNF) signalling is associated with zinc deficiency-induced impairments in cognitive and synaptic plasticity. Br J Nutr. 110, 2194-2200. Zhang, M.M., Yu, K., Xiao, C., and Ruan, D.Y. (2003). The influence of developmental periods of sodium valproate exposure on synaptic plasticity in the CA1 region of rat hippocampus. Neurosci Lett. 351, 165-168. Zhao, X., Malhotra, G.K., Lele, S.M., Lele, M.S., West, W.W., Eudy, J.D., Band, H., and Band, V. (2010). Telomerase-immortalized human mammary stem/progenitor cells with ability to self-renew and differentiate. Proc Natl Acad Sci USA. 107, 14146-14151.